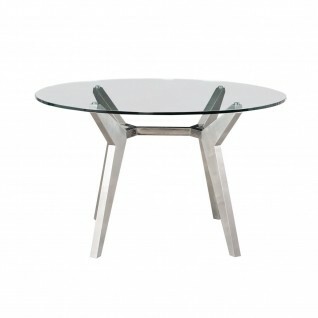 Costa Modern Dining Table features 15mm clear, crackle and smoked crackle tempered glass top with a unique abstract shaped silver polished stainless steel base. Costa Modern Dining Table features 15mm clear, crackle and smoked crackle tempered glass top with a unique abstract shaped silver brushed stainless steel base. Ovideo Modern Round Dining Table features a clear 12mm tempered glass top and silver brushed stainless-steel base. Dom Modern Dining Table features 15mm clear, crackle and smoked crackle tempered glass top with a unique abstract shaped silver polished stainless steel base. Dom Modern Dining Table features 15mm clear, crackle and smoked crackle tempered glass top with a unique abstract shaped silver brushed stainless steel base. 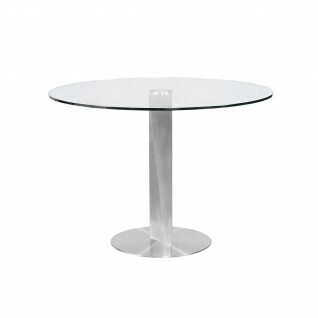 Rendel Modern Round Dining Table features a 15mm tempered clear glass top and silver brushed stainless-steel base. Cameron dining chair has a polished stainless steel rose gold electroplated frame with soft velvet tufted upholstery. Available in Black, Brown, Blue Colors. Cameron dining chair has a polished stainless steel silver electroplated frame with soft velvet tufted upholstery. Available in Black, Gray, Brown, Blue Colors. Rossi luxury dining chair has a polished stainless steel rose gold electroplated frame and tufted faux leather upholstery. Available in Gray, Brown and White colors. Rossi luxury dining chair has a polished stainless steel silver electroplated frame and gray tufted faux leather upholstery. Available in Gray, Brown and White colors. Lorensia glam dining chair features silver polished stainless steel base and comfortable seat with pearlized faux leather upholstery. Available in Black, Oyster and Champagne colors. 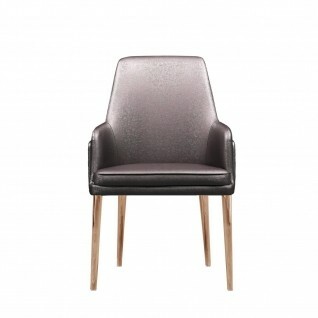 Kasandra stylish dining chair features a brushed stainless steel base with faux leather upholstery. Available in Brown and Beige colors. 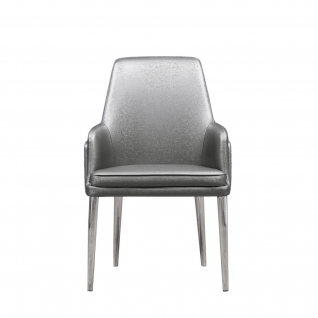 Sofia modern dining chair has silver brushed stainless steel base with microfiber upholstery. Available in Black, Gray, Cream and Mocha colors. Regina luxury dining arm chair has a polished stainless steel rose gold electroplated frame and soft black tufted velvet upholstery.Available in Black, Taupe, Beige and Pearl Beige colors. Stella stylish dining chair has faux leather upholstered seat and matching wrapped legs. Available in Gray and White colors.